Autumn is a great time to feed the birds if your are not already doing it. Migrating birds will start leaving for their journey south, and resident birds will start taking a break from raising young. This is a good time for the resident birds to collect some fat for the winter. You don't have to worry about some backyard feeding myths that circle around. Some people think that offering a steady source of seed will stop migrating birds from leaving. This is simply not true, migrating birds have instinct clocks build in them, and nothing is going to stop them from following their natural ways. Daylight levels and temperature change plays the most important role in how birds decide when it is time to go. On the other hand, migrating bird require a lot of energy for the trip south, so they will benefit from the food provided in bird feeders to get some calories. Bird feeders do not stop the migration, but can in fact help it. 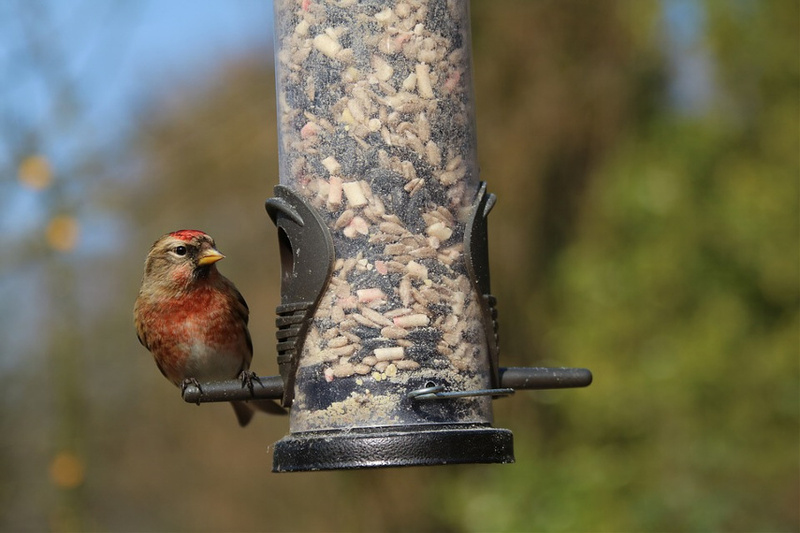 In autumn there is still a good supply of food from natural sources, wild berries, some fruit and seed are in abundance at this time, but bird feeders will still have a important role. A this time resident birds will start scouting the available food sources for the colder weather. Birds have a good memory and Will come back often to the same bird feeder once they check it out. Birds like chickadees like to stockpile food for the winter, and will often use bird feeders as a supply point, they usually hide the seed in several places around the feeder for the winter. Autumn is ever changing, dynamic time for the wild life, some will go to hibernation, but birds will not. If you offer them food at this time, your yard will become a meeting place for many birds. • Help resident birds build winter fat reserves for the cold months. • Provide migrating birds additional energy for the long trip south. • Offer supplemental source of food when the snow comes. • Attract the first winter bird species and encourage them to remain nearby all season. • Help birds fight any possible decease and recover faster, surviving the harsh winter can be easier when you don't have to spend energy looking for food. Feeding bird in autumn is providing some bird species even 30% more chance of surviving the winter, some researchers point out that fat stored in fall is essential for the coming cold months. If you plant o keep your backyard visitors happy, there are some additional things you have to keep on mind. Providing the right food is the first step, knowing how to keep them safe is another. Following these guidelines will keep your backyard flock happy, healthy and active. • Keep your feeders clean and refill often to prevent mold inside the seed. • If you have bird baths make sure they are filled with fresh, clean water, if you can afford it provide a water heater. • Make sure feeders are not damaged, and replace them if needed. • Buying a squirrel Prof feeder is a good option, you will not waste seed and you will save you money in the long run. • Protect backyard birds from predators by placing your feeder in a place where birds can see them coming.